I found a unique treasure in northeastern Arizona — the Hubbell Trading Post National Historic Site near Ganado. Businessman John Hubbell bought this store in 1878. The Hubbell family sold it to the federal government in 1967, but it's still in business–the Navajo Nation's oldest continuously operating trading post. The site encompasses the original 160-acre Hubbell homestead, including the trading post (which sells authentic Navajo Nation goods), a family home and a visitor center. 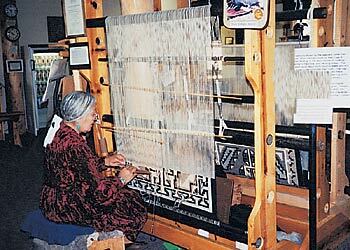 It was a real treat to watch Navajo weavers at work in the visitor center. You realize just how precious a handmade Navajo rug really is! The trading post is on State Highway 264, about a mile west of Ganado, which is where Highway 264 meets U.S. Highway 191, roughly 38 miles north of I-40. It's open from 8 a.m. to 6 p.m. from May through September; open only until 5 p.m. the rest of the year. Keep in mind that the Navajo Nation observes Mountain Daylight Saving Time year-round.